Screw dolls. Dress children. | Do the twisted. Sometimes, it’s hard to dress yourself in the morning. You can have a whole closet full of outfits, but yet you feel like you have nothing to wear. Pretty pathetic considering there are people in the world with one outfit. So if you have trouble dressing yourself, you can at least help dress a child. Besides, deep down I think we all dream of being a hero for humanity. 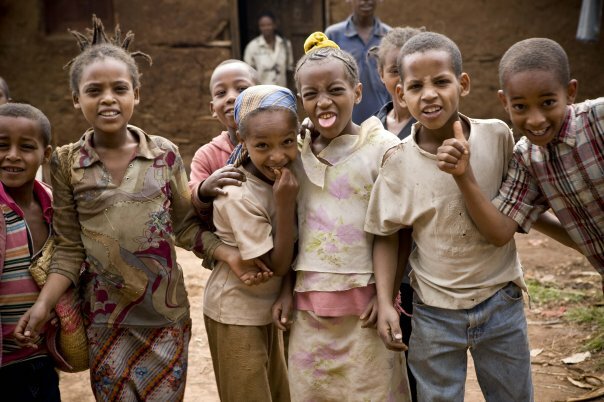 So with the help of TOMS Shoes, Socks for Happy People and 1 Million Shirts, we can make a difference in a child’s life. Not to mention we can dress them to look like total studs and babes. You may recall TOMS Shoes from the AT&T commercial with founder Blake Mycoskie last year. For every pair of shoes sold, they donate a pair to a child in need. We often take for granted our shoes. You think stepping on a rock barefoot is bad. Sheesh. Millions of children have to walk barefoot, often cutting, bruising or blistering their feet daily. As of April, TOMS has provided 600,000 children with shoes. And let me tell you something, they are the most comfortable shoes in the entire universe. I’m getting my second pair this month and it’s encouraging to know little kids are going to run for their life. Not from me, but because they can without cutting their feet. You don’t think about socks having much of a purpose other than putting one on your doorknob to let your roommate know you are busy knitting a sweater. 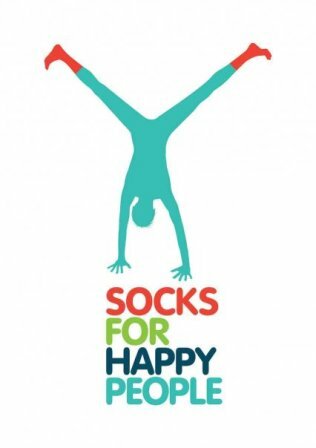 But they really help make the world a better place, especially Socks for Happy People’s socks. Made of organic cotton they bring cheer to you, your feet and children. Not only because the designs are magnificent, but because in my top ten list of worst things ever, cold feet and toes would be one of them. But who am I to complain when there is a child in Mongolia who has to endure -40 degree temperatures? So that’s why Tom Minter and Richard Taylor decided to donate a pair of socks with each pair sold to the Christina Noble Children’s Foundation in Mongolia. The kid’s socks they donate is made of wool camel hair, which can endure temperatures well to -80C. You like your piggies warm, so warm up a child’s piggies and make bacon. My Mama always said, if I haven’t worn it in a year, I never will. Surely, there are at least 10 shirts in your closet or drawers that you have not worn in a few years. So how about donating your shirts to 1 Million shirts, a new non-profit organization created by Jason Sadler? His goal is to gather 1 million shirts to help support the homeless and disaster relief areas. But in this case, not just children’s shirts because chances are, you don’t have any shirts from when you were a kid anymore. All sizes are accepted, but they best be in good condition. That means no shirts with holes in them or sweat stains. Gross. So go through your closet and imagine a man, woman, or child carrying on the legend of your shirt and wearing it with pride. To learn more about donating your shirts, visit here. So we have shoes, socks, and shirts. All we need are some pants and underwear and kids will be set. But for now, if these kids we help were to go to a store, they won’t have a problem facing the no shirt, no shoes signs anymore. Great post Jordan! Thanks for the info.